Incorporate SketchUp into every phase of your design If you want to go beyond the basics and start using SketchUp 3D modeling software in all phases of your design, The SketchUp Workflow for Architecture and Building Design is the perfect place to start. From preliminary schematics to construction documentation and everything in between, the book sketches out a workflow that is flexible enough to use from start to finish. You'll discover helpful techniques, smart tips, and best practices that will make your design process easier, as well as helping you easily export your models into BIM programs. The book includes in-depth coverage of the lightly-documented LayOut toolset and video tutorials on more advanced methods. 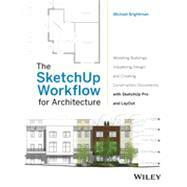 Goes beyond the basics into intermediate and advanced techniques for architects, designers, and engineers who want to use SketchUp in all stages of design Guides you from basic schematics through design development to construction documentation Includes best practices for organizing projects and workflows and helpful tips Provides special coverage of the LayOut toolset, an often-underused component of SketchUp Pro The SketchUp Workflow for Architecture and Building Design is a valuable addition to your design toolkit.